As a kid the only beets I came in contact with were the ones in a can. They were deep purple and stacked neatly in the tin. I could never eat them. I didn’t like the taste or the texture. When I got them in my mouth I would get that strong urge to spit them up. My parents were pretty cool and they never forced me to eat my beets. Maybe they didn’t like them much either. Over the last few years I have developed a fondness for beets. I love them when juiced with apples, carrots and lemon. I like them roasted, peeled, diced and tossed in a salad. I like them paired with cheese and drizzled with a light dressing. Today I tried something a little different. 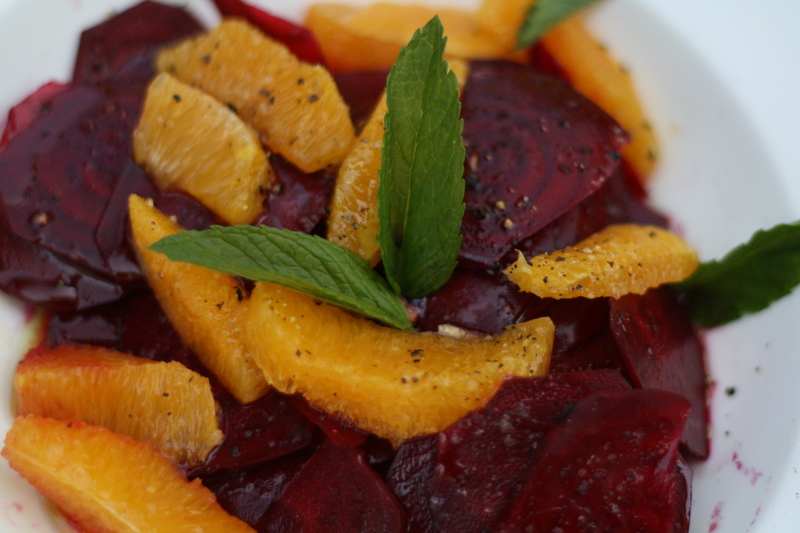 I made a raw beet salad with orange segments and fresh mint. I sliced the beets as thin as I could with my chef knife. It would have been better had I used a mandoline, but I don’t have one. I cut off the peel of an orange and cleanly removed the segments. I then place them in a white bowl and and squeezed the juice of another orange over the beets and oranges. I drizzled red wine vinegar and olive oil on top and then seasoned the salad with kosher salt and pepper. I got a few mint leaves from the garden to garnish the plate. I was really surprised on good the salad was. The beets were really crunchy and the fresh orange juice added just enough sweetness. Next time I will use a mandoline for an even thinner cut. yummy…. that looks delicious…. never would have thought of something so healthy and refreshing. Beautiful picture. Makes me want to cook and eat cleaner. Thanks Bill. I just had raw beets for the first time about a week ago! Purple ones AND yellow ones, thinly sliced and served in a salad … along with sliced radishes, baby carrots (both orange AND yellow), and radish sprouts … talk about an awakening!